Around 2:00 a.m. April 1, 800 peace activists from more than ten European countries gathered near NATO headquarters in Evere, Brussels. 500 people tried nonviolently to enter the NATO compound. About 20 activists succeeded to enter the military site, 483 people were arrested. At the main entrance of the NATO headquarters 300 supporters cheered the intervention teams. When peace is at stake, nonviolent intervention is necessary. NATO is a select club of countries that globally wages war, deploys nuclear weapons and is prepared to use them in a first strike. This military alliance is a danger for world peace. On May 20th and 21st, the heads of government of NATO member states will gather in Chicago. Today’s nonviolent intervention sends them a clear message: NATO creates more problems than it solves. NATO GAME OVER is an action of civil disobedience. 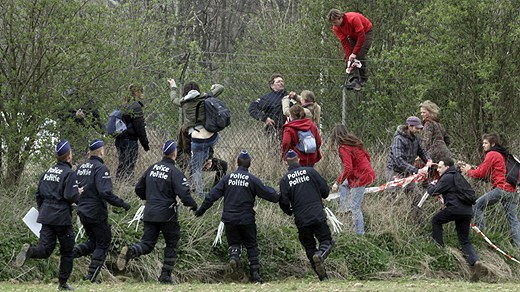 Nonviolent intervention teams tried to enter the NATO area in order to prevent a more serious crime, the preparation of war crimes. Delegations from Germany, the Netherlands, France, UK, Finland, Sweden, Turkey, Italy, Portugal and Spain participated in the action alongside Belgian activists. They all have a clear message for the government leaders who are meeting in Chicago for the NATO Summit on May 20th and 21st: “We do not want a missile defence shield, We do not want NATO soldiers in Libya or Afghanistan, We do not want dangerous, useless and illegal nuclear weapons”. NATO’s deterrence and defense strategy will prove to be a difficult issue. Since the last NATO summit in November 2010, the alliance has been looking for “the appropriate mix of nuclear, conventional and missile defense forces”, under the NATO Deterrence and Defence Posture Review. NATO member states will need to agree on the future role of the approximately 200 American tactical nuclear weapons that are still deployed in five European countries. NATO bureaucracy is keen on maintaining the status quo. However, nuclear weapons cannot be used without violating international humanitarian law and their deployment is a preparation of war crimes. These weapons do not serve any military purpose, and a majority of European citizens want them removed. NATO must overcome Cold War thinking, re-adjust its nuclear policy and withdraw these nuclear weapons. A failure to do so will be an obstacle for further nuclear disarmament. In Chicago, NATO-secretary general Rasmussen wants to decide on the priorities for the further expansion of NATO’s military intervention apparatus. The war in Afghanistan proves the failure of military intervention. Under the pretext of ‘Responsibility to Protect’, NATO attacked Libya to force a profitable regime change. The war left Libya a fragmented country, where armed militias struggle for power.